Rapid advances in technology can drastically alter military advantage. 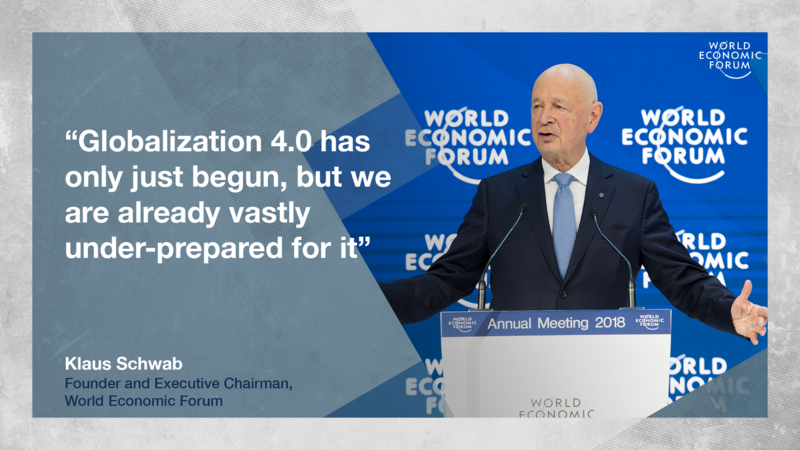 The new phase of globalization we have entered, Globalization 4.0, is making a core competency of governments and major businesses far less relevant. Businesses have become remarkably good at planning and then executing plans across complex, global supply chains. Similarly, many governments increasingly excel at setting boldly progressive policies and executing large, ambitious programmes. The problem for both is, the world is shifting under their feet. Fragmenting global order: Escalating trade conflict and eroding multilateral consultation on trade have significantly slowed (and sometimes reversed) what once seemed the inexorable advance of economic globalization. Expanding individual power: Ubiquitous access to information and increasingly potent social media tools give demanding citizens and consumers a far more powerful voice. The Fourth Industrial Revolution: Technological advances are rapidly redefining how we produce, consume, communicate, and ensure human wellbeing. This is placing dramatically new demands on public policy and business performance, while simultaneously transforming the optimal means of delivering both. In such an environment, policies and plans that were perfectly sound at the time they were conceived can be suddenly compromised by conditions and events no one could foresee. In light of this reality, our advice to companies is to prepare their supply chains to perform not only against plan, but also across all that is unplannable. Governments must also learn how to perform against the unplannable, for reasons of their own. The mandate of any government is to secure the long-term interests of its citizens, but now – to an arguably unprecedented degree – government must do so in a world of disruptive change in the short-term. No policy domain is immune to this fundamental shift. When setting economic policy, government leaders must account for the startlingly unpredictable ways technology can change how countries compete – for example, by making it possible to competitively produce many products anywhere in the world. Similarly, Ministries of Defence must plan acquisition cycles that extend decades into the future, even as advances in drones, exoskeletons and 3D printing (to name only three) can alter the landscape of military advantage in a year. Ministries of Labour and Education must design long-term human development strategies, yet the skills required by employers often change on a quarterly basis. How can government practically reconcile its long-term mandate with the near-term dynamism of the operating environment? First, as has long been true, policymakers must begin by systematically studying the long-term future through the application of strategic foresight – scenario planning, horizon scanning and strategic shocks analysis. These techniques are critical for creating the first draft of a strategic plan or policy design that is robust with respect to future uncertainty. However, even these tools are no longer sufficient in a world of accelerating change and compressing decision cycles. A more profound transformation is required. Adaptive government is a fundamental shift of intent, as governments recognize that their core competency in large-scale planning and execution is no longer sufficient. The established “plan and execute” approach must be aggressively augmented with new “sense and respond” capabilities, which were described in a business context by Erik Brynjolfsson and Andrew McAfee in Harvard Business Review. The goal is to institutionalize agility, by making government an instrument of adaptation, as well as a shaper and implementer of policies and plans. Two foundational elements of these new government operating models are adaptive systems and adaptive people. To implement strategy and policy effectively, governments must develop the capability to recognize change as it emerges, respond to it rapidly, and iteratively learn from each response. Technology will be a key enabler, opening a path to more adaptive government systems. The path forward will mirror the advance from paper highway maps to the modern GPS systems now commonly used by drivers worldwide. Today’s GPS programmes continually gather data to reveal changing conditions along your planned route and offer the best alternatives, so you can effectively navigate around traffic jams or other adverse conditions. In much the same way, the adaptive systems driving government action capitalize on a data-saturated environment to capture real-time insight into how a given strategy or policy is actually performing. Applying these capabilities, governments can engage in iterative policy experimentation, learning and refinement within greatly accelerated cycles. The principal means of these new systems include internet of things and artificial intelligence-driven analytics that distill flows of data to illuminate the specific impacts of policy choices – including their second-order effects. Over time, data capture can become integral to the design of policy itself. Economic ecosystems are another prime example of highly adaptive systems. Many countries will find it difficult, if not impossible, to cultivate all the capabilities required to effectively adapt to their rapidly changing environment while working in isolation. A practical alternative to traditional industrial policy focused on sectors or technologies is to actively enable new economic ecosystems that bring together the diverse capabilities and expertise required to address increasingly complex challenges. The power of ecosystems is already proven. In China, policies that support entire ecosystems in 17 National Innovation Demonstration Zones are beginning to pay off – with at least 13 tech unicorns emerging in China this year vs. four in 2014, and virtually none before that. Throughout the world, in fact, the high-tech industry, higher education institutions and venture capitalists tend to recognize their interdependence, and so form strong communities of self-interest which are, in essence, ecosystems that foster the healthy ‘coo-petition’ of ideas and solutions. By emulating such precedents, governments can demonstrate that collaboration in ecosystems is a requirement of enhanced competitiveness, no longer merely an alternative. For governments to be effective going forward, the people who execute policy must make varied, nuanced, and consequential choices, quickly, in response to rapidly changing conditions. Such choices simply cannot be governed by rigid policies and lowest common denominator thinking. On the other hand, inviting people away from the centres of control to make their own choices based solely on gut feelings will inevitably lead to fragmented effort and outcomes that are at best uncertain. The solution is to distribute decision making further out from the traditional centres of control, while rapidly building requisite new skills and behaviours, and guiding and augmenting human decision making with new technologies, processes, rules, and analytics. The most successful examples of adaptive government will make full and effective use of virtual and augmented reality based micro-learning, gamified learning systems, and artificial intelligence to enable personnel to execute their job in ways that benefit from having the necessary data to adapt in real time – just as modern GPS systems warn drivers of obstacles along their planned route and offer alternatives. In sum, adaptive systems combined with people capable and empowered to adapt will enable governments to sense when course correction is required and drive informed, effective responses to ongoing short-term disruption.